I would love to tell you that dressing a little one for spring means shorts and more in the northern parts of our country, but it very much does not. Instead, it usually involves a lot of mud, snow boots, and layers. Not far off from our wardrobes for the season at all. Since I get asked often how we dress Hayes for such an outdoors lifestyle throughout the season, I thought I would share a quick list of items we keep on hand during each season this year. This way this will help keep your little ones warm and enjoying the seasons along with you. I will tell you that dressing a toddler is far easier than a 1 year old was last year. I didn’t expect that, but now that he is more understanding that these layers keep him warm while he does his daily exploring his willingness is far greater to let me slip on mittens and boots than it was last year. I will say the problem at this age is getting mud on everything and growing quicker than you ever think they will. So, my cost for investment in clothes for him is far lower and I either am purchasing things from resale stores or picking things up from Target. Buying kids clothes is hard to be too conscious about I find. It has gotten better the older he gets, but with how many pieces of clothing he rolls through in a day and the rate of growth makes it really hard. I Have found though that sites like Gap and Old Navy fall apart and never work long so I no longer buy things from them, but if they are given we use them still. Most of the time I am buying things from the conscious line from H&M and getting things from Zara for him. I find these are my best options for stylish but not too trendy pieces that wash well, wear well, and fit him the longest. Since he is a taller and skinnier kid (currently 3 ft tall as a 2 year old) I have to buy things that fit his body style. I find the more euro cut works for his build and lasts the longest for him. We buy a ton from Zara for him as I LOVE the quality of the knits and how they wash up and are typically made of cotton so they are soft and comfy for all day play, but if they get food on them they wash without much work. I then fill in gaps with either Target or resale items for him as well. I find that Target has a couple cute lines and some great basics that we get a ton of wear out of. I also love H&M’s Organic Cottons as well. Finally, we do invest in qulaity weather ready footwear because I figure if we buy them in gender neutral colors shoes like rain boots and winter boots are needed throughout the year enough no matter when our next one comes in to our lives these will still be useful. Who knows I might eat those words later. All that to say, I find that there are places in spend a little with kids and getting them outside. We buy good mittens (the Patagonia ones works AWESOME! and you can actually get them on their hands…can you imagine?! ), we get quality hats, and we invest in our shoes that see the elements. I don’t spend a lot on play shoes but I do make sure the soles are flexible and thinner so he is getting in touch with the ground as much as possible. I actually have great luck with Target even though I wouldn’t buy shoes for myself there anymore, I do think for shoes that I can not worry about mud or getting ruined they offer a lot of good options with flexible soles at an approachable price. Everything else is negotiable. Sweaters are always cotton so they are easy to wash and I make sure to always buy them 1 size bigger. I also buy coats 1 size bigger so they will for sure last through the seasons. I did want to invest in a nicer puff coat for him, but knowing how warm he gets outside I knew this one from Zara would work just fine. Sure enough he comes in every time sweaty still. I also make sure he always has a pair of outer pants. We put away snow pants because it was getting too warm, but these Carhart overalls are PERFECT for outdoor dirty play over their normal clothes. This ensures there is no full undress. You can also get rain suits or rain overalls as well. Debated about buying some but haven’t pulled the trigger. Lastly, my greatest tip for dressing your toddler for spring is to always think in layers especially the later in the season we get. They may be cold when they step outside but make sure they have a long sleeve tee or a vest handy so they can undress as they get warm. Many times I will layer a tee with the fleece over it and then a vest on top. He likes this because he can tell me when it is time to take something off. Layers are essential for this time of year. Okay, below you will find some recommended piece for a toddler for a season. We have more than this in Hayes’s wardrobe because he goes through clothes so much in a day still, but this gets you in a solid direction to have what you do need. I always keep his wardrobe relatively neutral so that everything goes together. He has a few shirts of things he has picked out in his drawers but for the most part these are the colors we stick to the most. 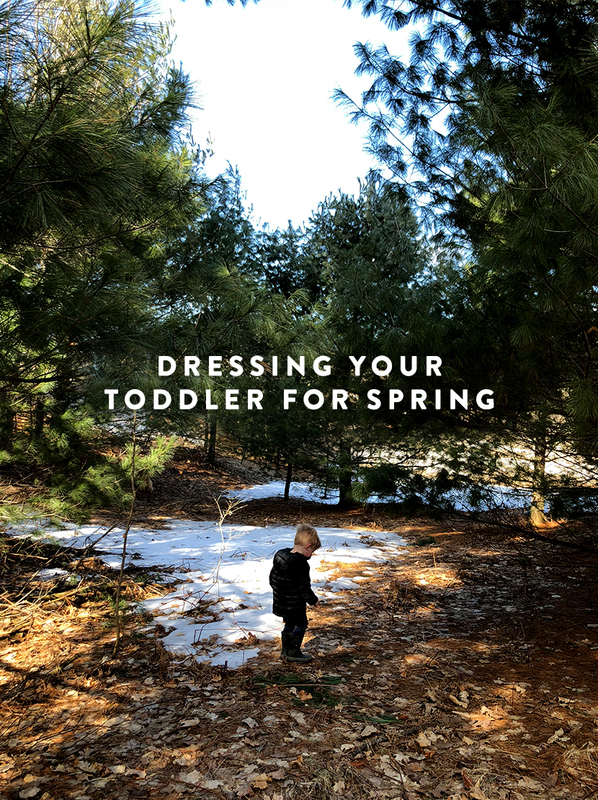 How do you dress your toddlers for the spring months? What tips do you have? This is such an awesome list! Thanks for sharing! During rainy season in the PNW, my toddler wears Polarn O Pyret rain pants and they are so good for layering. He definitely has a cute fisherman look with a sweater underneath, but they are so so good for our variable weather and layering.